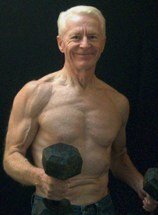 The Gray Iron Fitness Newsletter, Issue #03 Retirement Bliss and Horizontal Pull-Ups. In today's March 1, 2010 newsletter . . . The article on retirement ran twice last year. Both times it got reader response from those nearing or already in a retirement lifestyle. But how about the young whippersnapper seniors in their early 50s? Do they think the subject is only for the over 60 crowd? I hope not. Because the younger you are when you consider your future in retirement, the better off you will be. So please read on, everybody . . . The nosy people at AARP know when you turn 50 and send you an invitation to join up. In their eyes, you’ve just crossed that line — you are a senior, like it or not. It has been more than 20 years since I found my invitation in the mail box. At first, it was a punch in the stomach. Then I would joke about it with friends. But the clock stops for no one. People who don’t think much about retirement suddenly realize the day isn’t all that far off. Depressing? For some, yes. And that's too bad. Because here is the good part. When you do finally retire, you really can, if you choose to, rediscover your passion in life. Here is how I did it . . . I knew that art and fitness were my callings by the time I was a teenager, and probably even earlier than that. What I could do better than most of my peers was draw. And I was always looking for ways to build up my body. Other matters, some important and some not, diverted my attention along the way; but, finally, there I was — retired. I could actually do as I pleased. The years have passed and I have never really felt a void. In fact, it has been quite the opposite. I am fortunate to be absorbed in the creative process of making art and promoting the fitness lifestyle. Without these strong interests, however, or something equally engaging, I cannot imagine what life would be like. We've all seen people who retire and then vegetate in front of a television set. Probably your interests are very different than mine. But somewhere in each of us the interests are there, only waiting to be rediscovered and released. One good way to uncover them is by looking backward to your childhood and adolescence. Recall the thoughts, activities, and dreams that sent your imagination and spirit soaring. Those are your clues. Develop interests related to them and you are likely to experience a personal renaissance. The Arnold Press was a favorite of California's governor during his Muscle Beach days. He liked to start the press with his palms facing him, and as the weights were pressed overhead they rotated to face forward. He would retrace the movement in the reverse coming down. I've added something to the mix, dumbbell curls. I think you'll find that it's a nice upper-body combination movement that flows well, while working biceps, triceps, and shoulders. Watch the short demonstration video here.